Hello!!! I'm in San Francisco preparing for the Decorate book signing event tonight and can't wait to meet you, San Francisco! I have a very special guest that you will know if you follow decor8, she flew in just for the event and I can't wait for you to meet her. I'll tell you more when I see you in person! 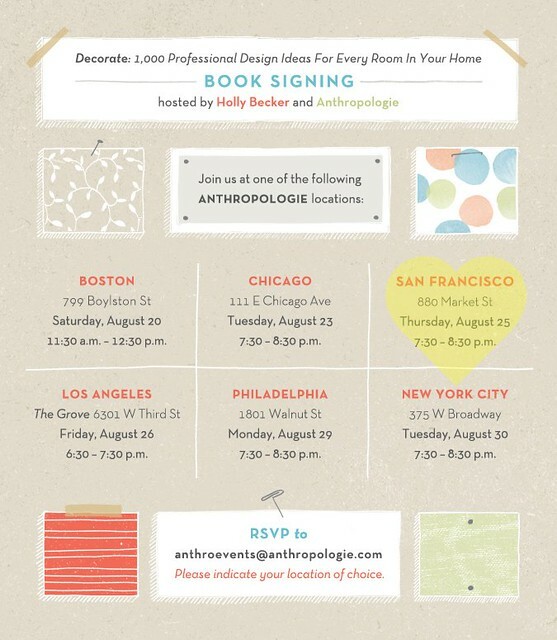 The event is tonight, Thursday August 25, at Anthropologie located at 880 Market Street. Please arrive anytime after my mood board presentation which will wrap up after 7:00 and I'll be there until 8:30 p.m.. signing books. We're expecting a lot of great people from local bloggers and designers to others who are even flying in, so it's going to be a wonderful night! Please note: Decorate is available for purchase at the event -- The book is currently sold out elsewhere and online and won't be available again for at least another month as they are reprinting for a 3rd time, so please make sure to stop by Anthropologie tonight to grab a copy for yourself, a friend, a present... whatever you'd like -- I'm here for one night and would love to meet you! See you tonight, San Francisco!